When you’re forking out hundreds (and sometimes thousands) of pounds on buying baby essentials such as prams, buggies or car seats, it can be a welcome relief to know there are some items you can probably get away with not buying. That’s certainly the view of more than 1,000 parents with a child under five when we asked them to rate the products they own on a scale of 1 to 5 for usefulness. * We excluded the core baby purchases of a child car seat, pushchair, high chair, and cot, as these are considered essentials. Top of this year’s least useful list is a top-and-tail bowl, which you use for washing your baby after a nappy change. Most parents tend to use wipes and then bath their baby when needed. If they do want to do a top-and-tail wash, they can use any bowls from their kitchen cupboard so long as they’re completely clean. In second place was a baby door bouncer (pictured above), which is a plastic or fabric seat with elasticated straps that attach to a door frame. 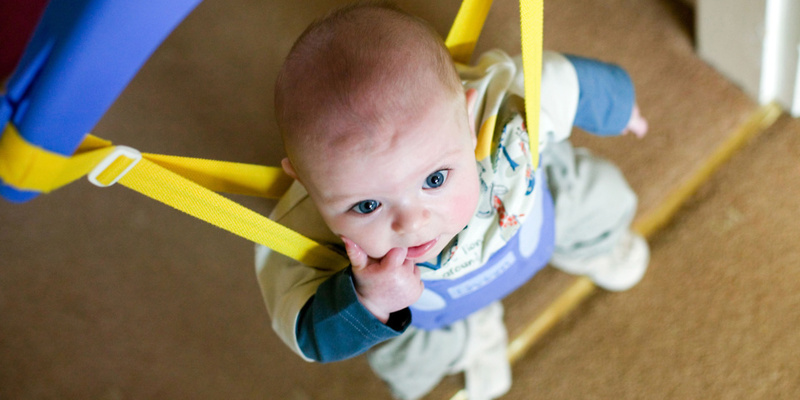 While babies may enjoy jumping up and down in one, our parents don’t rate them quite so much. Top of the ‘Most useful’ list is a cot mattress, which is a new entry this year. We recommend you pick a mattress that’s at least 10cm thick, firm and flat to ensure it’s the safest surface for your baby to sleep on. Following close behind is a stair gate, to keep crawling babies and toddlers at bay, and a video baby monitor. Browse our reviews to discover the best cot mattresses, stair gates or baby monitors that we’ve tested. There’s nothing more frustrating than buying a baby product and then not getting any real use out of it, especially if the money you could have saved could buy a more useful baby product. 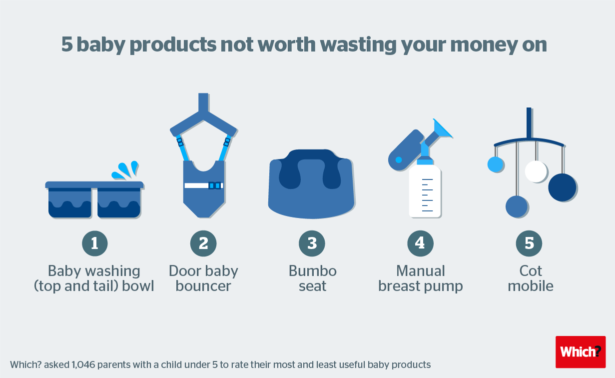 We worked out that if you chose to bypass the products on our top 10 list of least useful baby products, you’d be able to save £408 on average**. For that money you could pick out a Best Buy pushchair or car seat. Some of the least useful items were things that you probably already own in the house, and could simply repurpose for your baby. For example, instead of a nappy stacker, which came in at number seven on the list, you could just use a cheap box or basket. Read the full guide to the 10 least useful baby products to see if there is anything you might be able to strike from your shopping list. 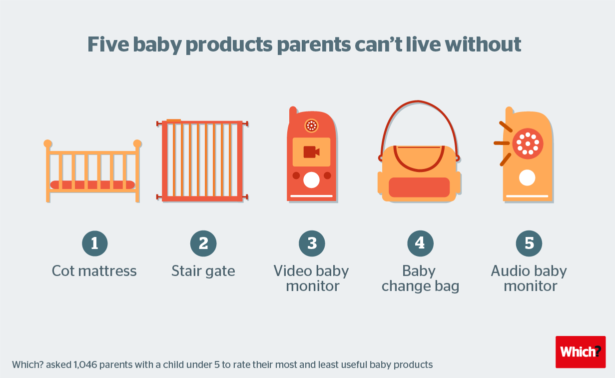 Staying connected to your baby seems to be a priority for many parents, and this was clear from our list of most useful items. Video baby monitors and audio baby monitors have both made it into the top five, while smartphone baby monitor apps – where you use your phone to connect to another device and use it as a monitor – have appeared in the top 10 for the first time. Safety is also a priority with stair gates (last year’s number one) proving a popular purchase for parents – nearly 60% of parents own one. To find out what else has made the list, head to top 10 most useful baby products. * Our research: In February 2017 we asked 1,046 parents of children aged five and under about the baby products they used, asking them to rate them on a scale from most to least useful. ** Total money saved by not buying the 10 least useful products was calculated on the basis of the average price of the products online at major parenting retailers, week commencing 9 October 2017. Top-and-tail bowl – £5; Nappy stacker – £10; Bouncer – £30; Reins – £15; Bumbo – £38; Air purifier – £100; Manual breast pump – £20; Bottle warmer – £30; Cot mobile – £25; Electric breast pump – £135.